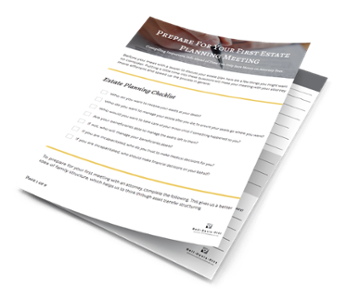 If you’ve started to think about estate planning, then you might be wondering how you should prepare for your first meeting with an attorney. Before meeting with clients, we send them a family history and financial summary worksheets to fill out before the meeting. This gives us a better idea of family structure, which helps us to think through asset transfer structuring. Who do you want to receive your assets at your death? Do you have any family property or heirlooms that you wish you stay in the family? If you have a minor child, who would you want to take care of them if something happened to you? Who would you want to manage the inheritance you left for him or her? Who do you want to be in charge of resolving your financial affairs after your death? For example, paying your final bills, distributing your personal items and transferring your accounts to the beneficiary. If you are incapacitated, who do you trust to make medical decisions for you? What about financial decisions? These are just a few things you might want to consider before you meet with a lawyer to discuss your estate plan. Having put a little bit of time into these questions will make your meeting with the attorney more efficient and speed up the process generally. As the New Year approaches, you might consider making an appointment with an attorney to check your estate plan off your “to do” list.